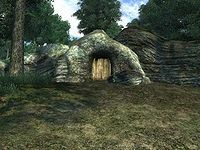 Robber's Glen Cave is a small cave northwest of Bravil containing imps (quest-related). It contains only one zone, Robber's Glen Cave. This cave always contains 12 Imps, even at high levels. 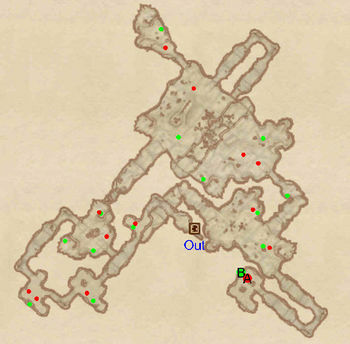 Thus, this cave is one of the few guaranteed sources of Imp Gall in the game. This cave contains 6 Cairn Bolete plants and 11 Wisp Stalk plants. 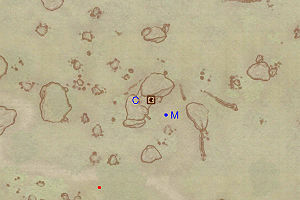 This location's map marker (M on map) is named Robber's Glen Cave (editor name RobbersGlenCaveMapMarker). The entrance door is NW of the marker, 30 feet away. The following plants can be found near the entrance: 8 Fly Amanita plants, 2 Green Stain Cup plants, 5 Lavender plants, 32 Monkshood plants, 1 Somnalius plant, and 8 Summer Bolete plants. This cave is entirely populated by imps, other than the boss-level monster. Upon entering you will encounter an imp guarding a minor loot chest. The next two rooms each contain another chest, with an imp and two imps respectively. The third room has three chests and two imps. The next room also has two imps, but only two chests. Head into the southeast tunnel to face the boss-level monster (A) and loot the boss chest at B. Track back and head northeast until you reach a large room bisected by a canyon. There are two imps and two chests on your side, and roots bridging over the gap. 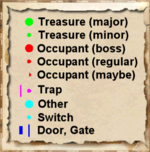 Cross over to find another chest and imp, with the same combination repeated in the small room to the northwest. Do not bother with jumping down or taking the southwestern tunnel, as these do not lead to any loot.